We don’t really give much coverage to the rugged device category, but it’s at least somewhat cool see what companies can do when they want something that can withstand all sorts of extreme environments. Today Dell is announcing their latest fourth generation edition of the Latitude Rugged Extreme 12 and 14 laptops. These are fourth generation in the sense that they’re using Intel Haswell CPUs, but they’re also the fourth iteration of rugged devices from Dell in the past seven years. That’s a bit long compared to the consumer side of things where we see yearly or sometimes even more frequent updates, but for rugged devices designed for industrial, military, etc. use the rate of change tends to be slower. That said, these are both all new designs, and while they build off of Dell’s previous experience in the ruggedized devices market, they will require new peripherals – specifically a new docking connector means you would need new vehicle mounts and docks if you want to upgrade from previous generation offerings. One of the new features is that both the Latitude 12 and Latitude 14 now work with the same docking connector and the docks – vehicular or otherwise – work with both laptops. That’s beneficial for companies that have shared vehicles (or desks) where one user might prefer a Latitude 12 and another might want the larger Latitude 14, and with this update Dell expects to support the new connector/docks for several years. Getting into the particulars, both laptops feature 1366x768 resistive touchscreens that are designed to be outdoor-viewable. The displays provide improved outdoor functionality via higher brightness ratings, but more importantly they also focus on reduced reflectivity. The latter is critical as simply cranking up the brightness can create a major drain on battery life, and with too many reflections it’s still not ideal. The screens use three main layers: the LCD (with anti-glare coating), a direct-bonded touchscreen (with another anti-glare coating), and then a final layer of Gorilla Glass. There are no air gaps, which should greatly reduce reflections. If you’re wondering about the use of resistive touchscreens, the screens are designed to function even when someone is wearing heavy work gloves, so capacitive touchscreens wouldn’t suffice. Also note that the 12-inch model includes multi-touch support so it can work like a regular tablet with all the usual gestures. One area where Dell touts their superior design is with their fourth generation QuadCool thermal management. Most fully rugged laptops are fanless in order to seal off the chassis from dust and water, but Dell was able to create a fan unit that’s sealed off from the rest of the notebook – and they were the first to provide active cooling with a rugged device. The benefit is that Dell’s rugged laptops don’t need to sacrifice performance in order to meet IP-65 requirements, which is what often happens with other rugged devices where they have to use lower power processors. Dell is also able to support a discrete GPU (GT 720M) in the Latitude 14 Rugged Extreme, though that’s not a particularly potent GPU. There’s passive and active heat dissipation, with the fan engaging if the components get hot, and an operational range of up to ~145F. The fan is fully water/dust resistant (IP-65 again), so you can spray it with water to clean it out if needed. Dell reports that in testing of the laptops, even in a hot vehicle in a desert location, the active cooling is able to keep performance high and avoid throttling. Without getting too bogged down in the regulatory and environmental specifications, both laptops meet IP-65 requirements (dust-tight and protected against pressurized water). They are also dropped 26 times each at 48”, 60”, and 72” as well as at 36” while operational. It’s the sort of device that should withstand just about anything that might conceivably happen in the course of a day, and the pictures and videos Dell has emphasize this fact. The laptops also come with good support for legacy devices, including optional ExpressCard/54 or PCMCIA (PC Card) and one or two serial RS-232 ports. The 12-inch model does require the sacrifice of one of the USB 3.0 ports as well as the card reader if you want ExpressCard/54 or PCMCIA support. Both laptops also include two M.2 internal slots, though the SSDs are still mSATA – and it’s nice to see that Dell has fully embraced SSDs on the newest models, with no HDD options available. Legacy support might seem a bit odd for a modern device, but the target markets (military, scientific, industrial, etc.) often have different requirements and need things like serial ports. Despite having a few children, I’m not the target market for these sort of systems, and I suspect that’s true of most of us. The military is obviously one of the big markets, and industrial machinery would be another. Law enforcements and emergency vehicles also use such devices. 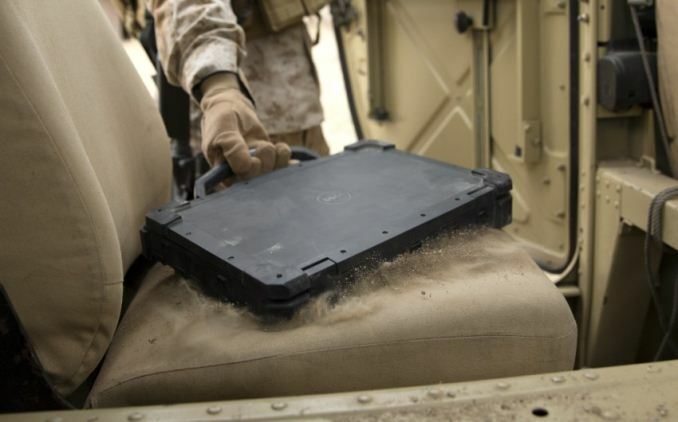 Dell mentioned that the SSDs are designed so that they can be removed within 30 seconds without the use of tools as part of the military requirements, which is pretty cool to think about for a machine that can be dropped, soaked, and/or covered in dust. Security features like TPM 1.2 are also present, and a variety of other extras make these very niche devices, but important ones nonetheless. Pricing and availability are scheduled for next month, though availability will vary by region. Given the fully ruggedized nature of these laptops, as expected the prices are quite high. The Rugged Extreme 12 starts at $3649 and will be available May 6, while the Rugged Extreme 14 is slated for a mid-May launch with a starting price of $3499. If you need something that can withstand harsh environments, be ready to pony up. In most cases i would agree with you, But i think high-res screens in this category are just not available. To give you an idea of what we're talking about: toshiba's rugged laptops feature an display with 1000cd/m brightness. Common sense is that fast and accurate input in the field is a lot easier with a low res display. Clearly, this product isn't targeted at you. "Starting at 7.79 lbs. (3.54kg)"